← Fragrance can bring the joy , especially as flowers bloom in the spring time. The controversies over the demolition order of the divider fencing and common playground were finally cleared by a 4-Parties Meeting held in Melur conference room at MPSepang Cyberjaya this afternoon. The meeting called by YDP was chaired by Puan Rozeta Binti Md Yusof (Pengarah Jabatan Perancangan) it was attended by Mr Teh, Mr Tai and Mr Yap from Plenitude, Mr Issac Lai & 2 committee members Chen & Kiew from 8B, Ahli Majlis Mr Pulanthran, And few other officers from the Majlis. Our 8A RA delegation was represented by Chairman Mr Kong, Mr Ng Kuo Sin, Dr Joan Tan, Priya and Aaron Wong. Puan Rozeta started the meeting with her welcoming speech followed by briefing on the current status of 8A & 8B G&G application process and approval. 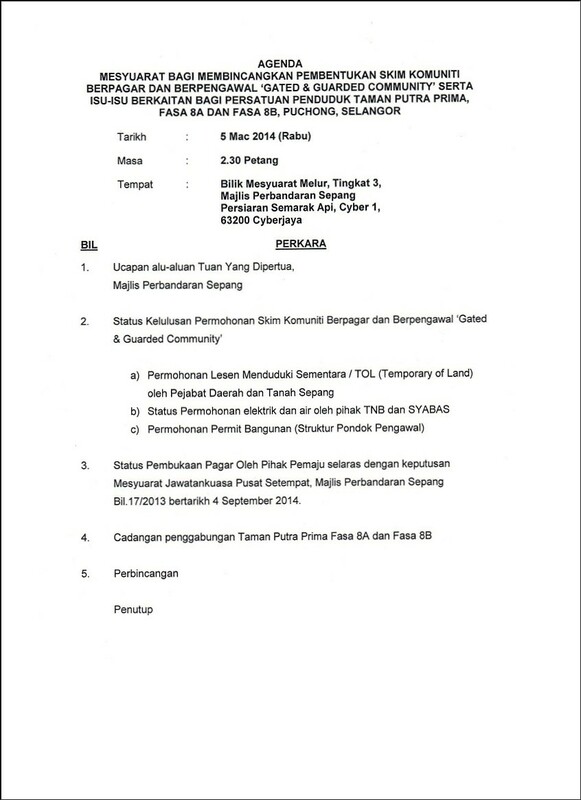 Both 8A & 8B were granted the approval for G&G planning, while 8A got all the necessary approvals or license for Gated and Guarded Community Scheme including the TOL, Building Permit, TNB and Syabas for the guard-house. Whereas 8B guard-house still not getting the TOL and Building Permit yet, There are still some technical matters pertaining to the issue (i.e. too close to the main road and sitting on the drain). The existing divider fencing shall remain for security reason until further decision on the following 2 options suggested by Puan Rozeta. 8A and 8B shall merge as one scheme, the 8B existing entrance shall serve as emergency exit only, the main entrance for the merger scheme shall be the existing 8A entrance, to remove the existing divider fencing and to open up 2 connecting road barricades. 8A & 8B will be separated entirely with fencing on both sides of the playground, small gates will be provided along the fencing, each RA shall decide and manage on the opening hours of the small gates along their side, maintenance of the playground equipment by the Majlis, the cost of putting up the 2nd fencing is entirely borne by developer. Next follow up meeting will be fixed in April to decide which option is preferable by the delegation of 8A and 8B. Once decided the meeting will go into more in-depth discussion. The blog admin/editor will not publish or approve any irresponsible or derogatory comments onto this blog especially by those anonymous readers. As our blog has reached over 50,000 viewers worldwide todate. 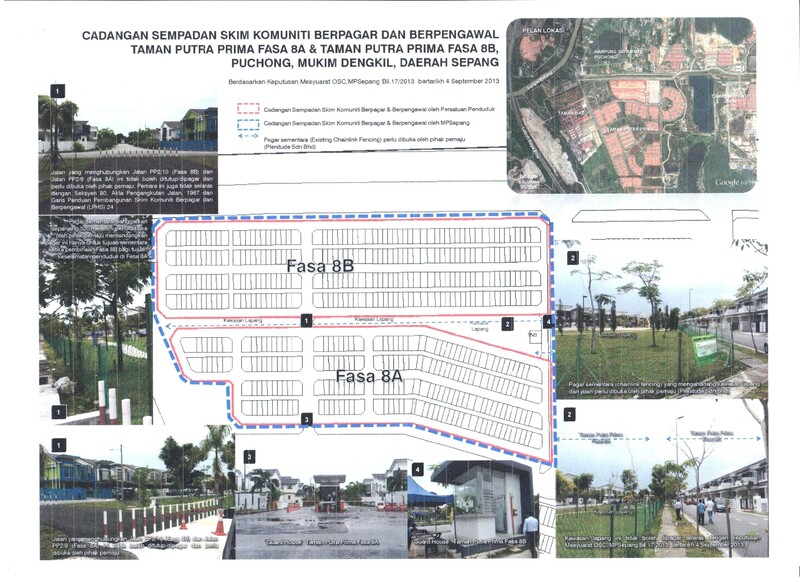 Nothing is more important than upholding the success, harmony and image of the first Gated & Guarded Community Scheme with full approval status by Majlis Perbandaran Sepang in Taman Putra Prima. Option 1 and Option 2 is not an easy choice. 8A is certainly to sacrify more in any of the options, the answer is not as easy as multiple choice by just ticking option 1 or option 2 or just abstained. Please ask your committee what if I choose option 1, and what if I choose option 2, any problem if we choose option 1 or option 2. Personal preference and opinion poll is on one hand, While administrability, technicality and viability is on the other hand. Easy way out, option 2. But for long term benefit, option 1. Those who are going to live here for the long term, so very clearly which is the better option. Unless you are investors who are here just for short term gain, so they would prefer ‘you know which’ option. Although option 1 is very challenging, option 2 would cost more to maintain.